cb.blog – Page 2 – "And can the liberties of a nation be thought secure when we have removed their only firm basis, a conviction in the minds of the people that these liberties are the gift of God?" 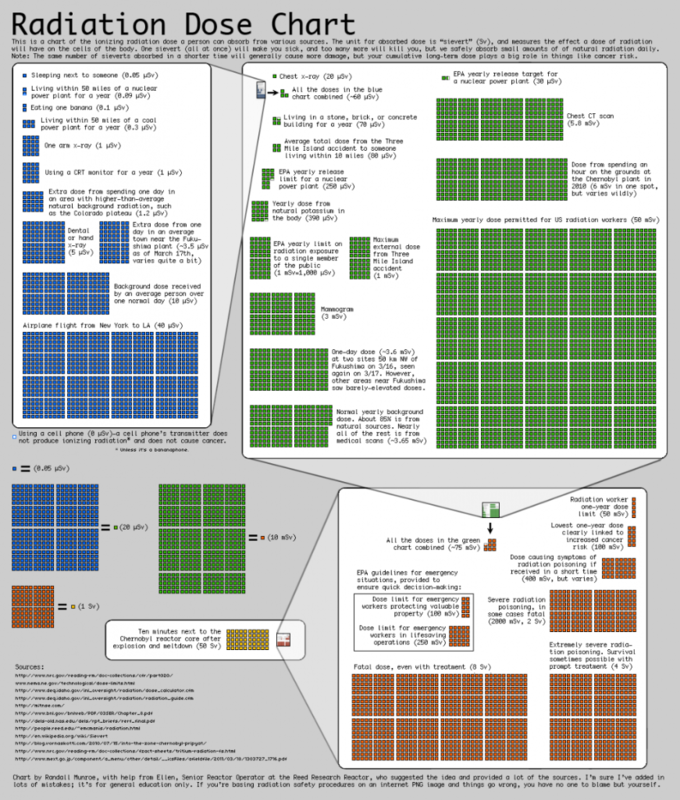 More than likely, this infographic should help to allay some unwarranted fear about radiation and health effects. The inter-tubes are awash in tutorials for how to add Theme Options to WordPress Themes - so why write another? Primarily, because most such tutorials are several years old, don't implement current best-practices, and were written without any awareness of the WordPress Settings API. While others such as Otto and Ozh have done yeomen's work in explaining how to implement the Settings API, I have not yet come across anything that really put everything together, and explained the process and implementation from beginning to end, in a way that even the less-experienced Theme developers (like me) could easily understand. Throughout this tutorial, I will be using code from my Oenology Theme for implementation examples. For full code, see the latest development version. Header Navigation Menu Position: currently, Oenology displays the Header Navigation Menu above the site title and description. I am adding a setting optionally to display the Header Navigation Menu below the site title and description. Header Navigation Menu Depth: currently, Oenology is designed so that only the top-level Pages display in the Header Navigation Menu, and Child Pages display in a left-column sub-menu. I am adding a setting optionally to display Pages to a depth of one (top-level Pages only), two, or three, with hover drop-down menus. Footer Credit Link: currently, Oenology does not display any form of footer credit link. I am adding a setting optionally to display a footer credit link. Varietals: the default style of Oenology is intentionally minimal. It is intended to be clean, simple, and cross-browser. I am adding a setting optionally to select from among Theme "skins" (which, in keeping with the oenology metaphor, will be called "varietals"), which will apply different color/style schemes to the Theme. Given that I'm only adding four Theme options, I could very easily put all four together on one Settings page. However, I may want to add additional options in the future - and also, I want to provide a proof-of-concept for creating complex Theme Settings pages in a way that supports the Settings API. So, the Theme Settings page will have two tabs: "General", and "Varietals". Further, the "General" tab will have two sections: "Header Options" and "Footer Options". So, that's our basis. Let's get started! Oh, rutabaga, where have you been my whole (low-carb) life? I have been a dedicated low-carber for over a decade. While I could go the rest of my life without eating another dessert or drinking another soft drink, my meat-and-potatoes farm-community up-bringing often leaves me missing starch-laden foods of my youth, such as fried potatoes and biscuits and gravy. In fact, when I decide to splurge, it is almost alway with one of these two foods. In over ten years of living low-carb, I had never found a suitable, low-carb replacement for crispy potatoes fried in bacon grease. Enter the rutabaga: humble root vegetable, that also happens to be incredibly low in carbohydrate (under half the net carbohydrate content of a potato). While not a strictly low-carb food, it makes for a great option for the occasional potato fix. 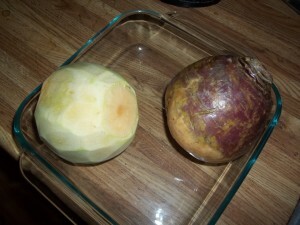 Apparently, the rutabaga has fallen out of popular use, due to its reputation as famine food during World War II. How unfortunate. As it turns out, the rutabaga is basically just as easy to work with as the potato, and makes an equally good accompaniment as the potato when fried. 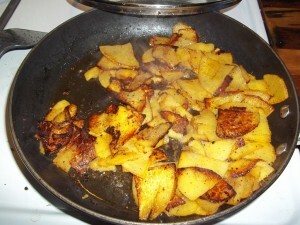 Here are the results of tonight's experiment with making fried rutabaga. 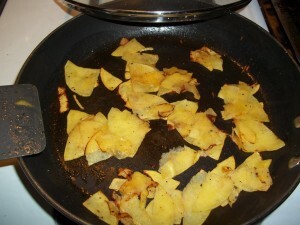 I initially fried a small batch (1/2 rutabaga) of potato chip-thin slices, to get a feel for the texture and taste of fried rutabaga. Having discovered that rutabaga fries essentially the same as potato, we were pleasantly surprised further to discover the mild, natural sweetness of rutabaga that - especially when crispy-fried - pairs in a rather addictive manner with a little salt and pepper. Finding the trial run successful, I set the mandolin to one setting thicker, sliced another whole rutabaga, and fried the whole batch in bacon grease, as before. This batch definitely took longer to cook than the potato chip-thin slices, but still barely took longer than the time required to broil pork chops. 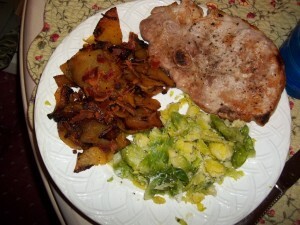 The pork chops and fried rutabaga (garnished with a few bits of crumbled bacon), combined with some Brussels sprouts "slaw" (steamed Brussels sprouts, core removed, mashed/quick chopped, with butter, Parmesan cheese, and a few drops of lemon juice) made for a tasty and - and unexpectedly filling - meal. 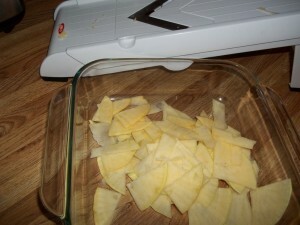 Next up: rutabaga chips in the deep fryer, rutabaga soup (using my secret family potato soup recipe), and roast with rutabaga. Since Theme developers don't (at least, not yet) have SVN-commit access for the WordPress Theme Repository, I decided to host Oenology on GitHub. Git is an entirely different beast from Subversion, so it took me a bit to figure out exactly how to use it. So, for the most part, this post is my own personal cheat sheet, though perhaps someone else new to Git might also find it helpful. One major difference between SVN and Git that I quickly discovered is that SVN defaults to setting up subdirectories for the working copy (/trunk) and previously tagged versions (/tags), but Git does not. So, whereas with SVN, my local repository checkout (i.e. the directory tracked by SVN) was simply a directory called /oenology, with Git, it made more sense for me to create my own subdirectories: /master for the working copy and /tags for tagged versions, and then do my Git checkout in /oenology/master. git tag -a "Version Number"
For more detailed help, refer to GitHub Help, and to the Git Reference.